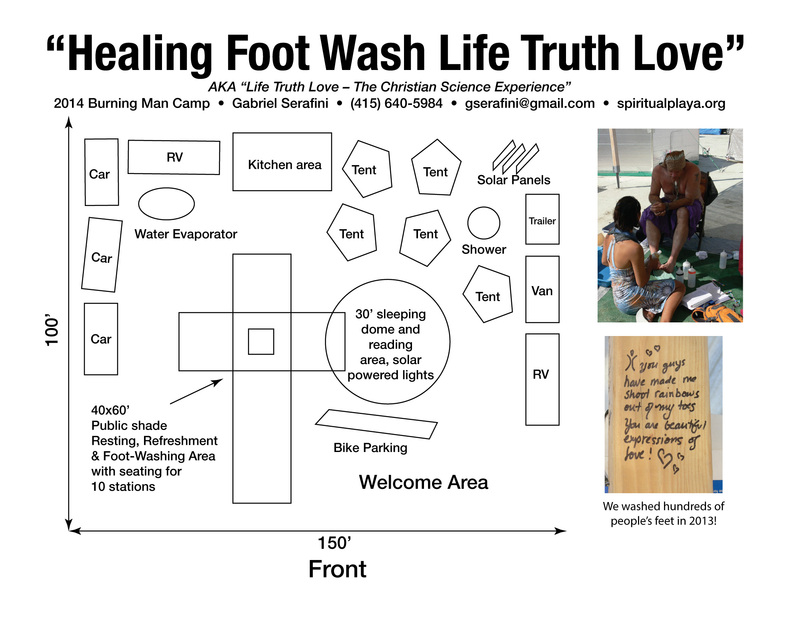 This is a video at Burning Man in 2013, showing the simple method we used to wash over 200 people’s feet at our Christian Science camp. This year we’re planning on washing over 1,000 people’s feet. We’ll also be offering Christian Science prayer / treatment for anyone who requests it at our camp, along with three metaphysical talks by John Tyler, CSB, hosted at Sacred Spaces (4&Gold) and Center Camp. If you’re going to Burning Man this year, look for us in the Isfahan and 9:15 neighborhood. We’re looking forward to washing your dusty feet! A warm thank you again to everyone who has helped us in any way this year. Our hearts are filled to the brim with gratitude. A HUGE THANK YOU to everyone who has helped raise awareness of our mission and helped with fundraising. This year we’re hoping to wash 1,000 people’s feet, and still have some additional expenses we would like to cover. The supply truly is there, and thank you to everyone who has been supporting this project metaphysically. All local Bay Area participants (and friends) who do not have previous hard commitments will gather at the Berkeley CSO (2601 Durant Avenue, Berkeley CA 94704) on Sunday 8/10 (1 week from today) starting at 12pm to do the initial shake-out of our major camp pieces (tent, shade structure) and to also take inventory and begin organizing. Food will be provided. Please feel free to invite any friends who might be interested in helping us out. Everyone else is encouraged to be part of the regular 5pm PST group call, which will be focused on metaphysical preparation, inspiration and sharing. 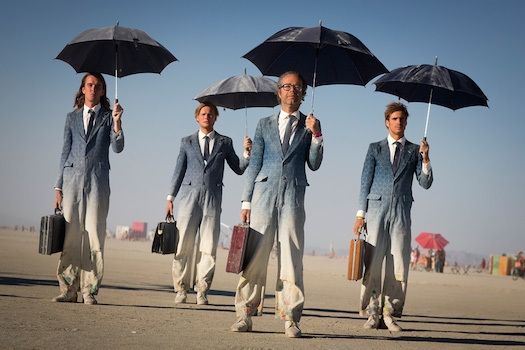 Please take care of your personal packing needs soon — Burning Man will be upon us sooner than you think! Start taking personal inventory of what you have and what you still need to get. Particularly if you are in the Bay Area, local stores will start selling out of Burning Man related gear soon, so get what you need now! THANKS EVERYBODY, and see you all in 3 weeks on the playa!!! I know it must feel like it was just yesterday that we had our last conference call, and we have another important one coming up on Sunday. If you’ve been missing these and can be on the next few calls that would be great… it really helps the team feel cohesive when we’re all participating! – Has anyone not received their tickets yet (that aren’t at Will Call)? – How many people have read this year’s version completely? – This is REQUIRED READING for ALL camp participants. Please do this sooner rather than later. Online version: http://survival.burningman.com, you should have also gotten a copy with your tickets if they’re delivered. Anna Lisa contributed a lovely write-up of her experiences as a camp participant at the 2013 Burning Man festival that has now been published on ChristianScience.com. We prayed thoughtfully and earnestly for ourselves and all those who would be coming, but we arrived with few outlined outcomes. We planned to gently embrace this city of lively seekers by seeing their spiritual worthiness as we washed dust from their feet. What a surprise that in doing so, we discovered we were in the middle of church! Being in this very unique environment led me to some new thinking on what constitutes Church. Here are a few ideas that came to me in that windswept space about Church pared down to its core essence. Greetings friends! This is the postcard and letter we sent out to many churches and friends recently. If you know anyone who might appreciate seeing this, please feel free to share this with them! There are less than 2 months until Burning Man happens and things are really starting to to come together! Thanks again to everyone on the team who has been contributing so that everything get done that needs to get done! We all love to share “a cup of cold water”, the profoundly good news of Christian Science, with receptive hearts. The purpose of this letter is to acquaint you with how a group of us has been doing that at an unusual venue, and invite your prayerful and financial support as we continue this year. We appreciate your sharing this letter as widely as you can, posting it if possible, along with the card. The event is Burning Man 2014, a temporary city of over 60,000 who meet for a week in the Nevada desert to share art, music, a gift-based economy, and free thinking. For a number of years, a few students of Christian Science have been a part of this community, sharing the good news of Christian Science healing. This blossomed into a somewhat larger group giving Christian Science lectures in 2012 and again in 2013 to some wide-open listeners. Our informal group of Christian Scientists will be bringing John Tyler, CSB, a member of the Christian Science Board of Lectureship, to interested and hungering hearts this year. In addition to supporting the lectures, the group will be washing feet again (a very well-received gift offered last year), giving away copies of the Bible and Science and Health, and offering prayer or Christian Science treatment to any who request it. Please join us in prayer in support of our time there from August 24 – September 1 2014: prayer that sees man as whole, pure, good, including all coming to Burning Man. We would appreciate prayer now as well, as we prepare. and Health and the Bible to give away as gifts at our camp. Written in or underlined is OK. Books may be sent to Christian Science at Burning Man, Care of First Church of Christ, Scientist, 795 West Peckham Ln., Reno, NV 89509.
the expenses that will be covered by donations from individuals and churches. Thank you in advance! 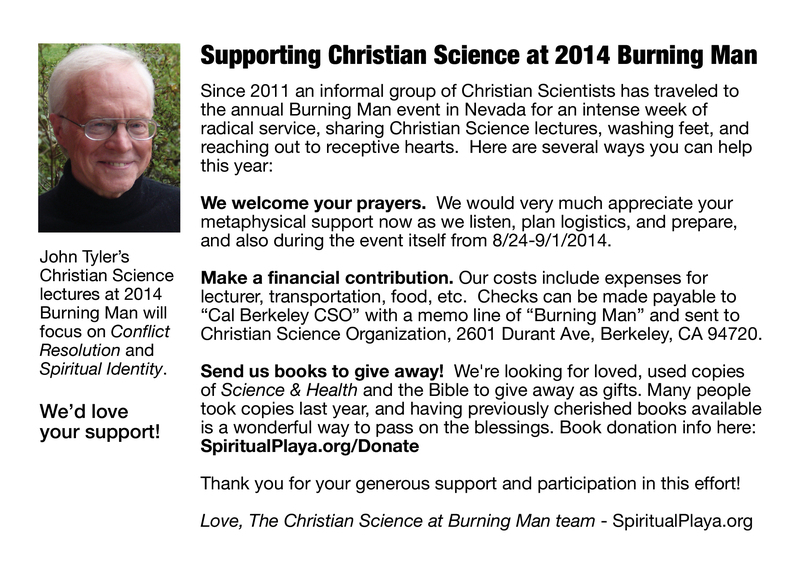 Checks may be made payable to “Cal Berkeley CSO” with a memo line of “Burning Man”, sent to Christian Science Organization, 2601 Durant Avenue, Berkeley, CA 94704. Any amount is appreciated. You can find more information, videos of the Burning Man lectures, pictures, links to articles, and may donate online via PayPal here: https://spiritualplaya.org/donate/. Thank you for your interest, prayers and support! 2014 Burning Man Camp Placement Questionnaire Submitted!!! If we receive Placement, we’ll be required to arrive before Gate opens to setup our camp. This will impact our scheduling. We’ll need at least 1 person on-site to secure our placed location, and they request we have our camp fully setup before the general public begin arriving on Sunday. We’ll probably shoot for somewhere between 3-6 people to be part of the Build Team, possibly up to 12. Our earliest arrival date will be Thursday, August 21, 2014. We had to submit a name that was 33 characters or shorter for our Camp name. I chose “Healing Foot Wash Life Truth Love” for this purpose, since our previous “official” name was too long. I requested placement in the 9:00 Portal, 7:30 Portal and 9:00 Streets areas, each with 150′ of frontage area. Please provide the name of your Camp or Village. You will be limited to 33 characters. You may wish to drop words like “A”, “The”, and even “Camp” from your camp name for better positioning in alphabetical listings. To honor our principle of de-commodification, we ask that you not include the name of your commercial enterprise in your camp name. Please describe your Camp and how you will promote personal interactivity of our community within your Camp at this year’s event. Please be as specific and concrete as possible. We are interested in reading your schedule of events, your plans for service, gifting and hosting in detail. (This is the most important information we are collecting from you). Our camp enthusiastically provides foot wash stations in a loving, safe, non-sexual environment where visitors can sit on comfortable chairs and have their feet washed. In 2013 we washed hundreds of people’s feet, and received glowing reviews from everyone (see below for some of their comments). Many people were surprised to find us (we were unplaced last year) and visited us each day once they found us. We’re asked why we wash people’s feet? Our goal is simply to love everyone who visits in the purest way we can, by providing a much needed and appreciated service. We also discuss spiritual topics with visitors if they’re interested, and share additional gifts of loved spiritual books if appropriate. Our motivation is based in the Biblical examples of foot washing as a pure service of love. 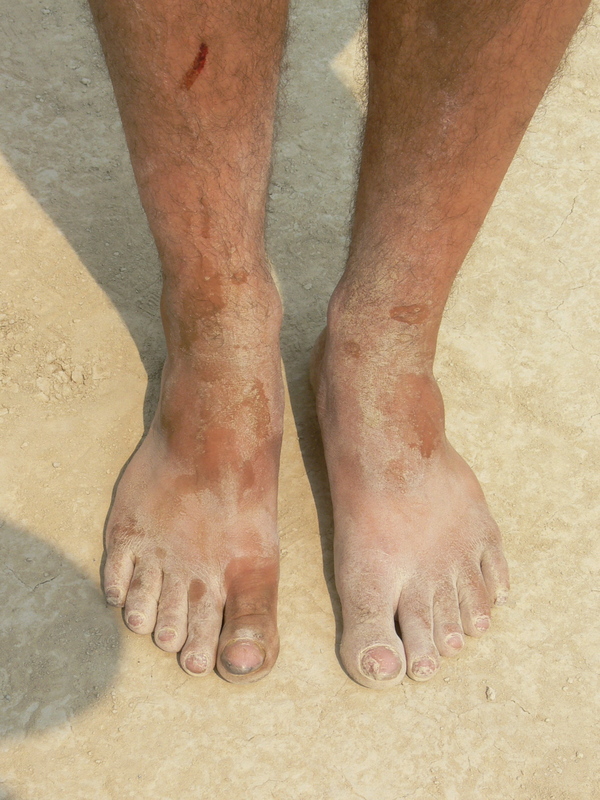 This year we’re returning with more camp participants, and plan to wash even more feet. It was a totally awesome experience last year, and this year will be even better. We provide manned foot wash stations primarily during daylight hours, from breakfast through dinner time. Our goal is to have 10 stations ready at all times. We’ve recruited additional participants to ensure there are always people available to provide the service. We encourage our “customers” to return and wash other people’s feet, but they must have their feet washed first. We provide the supplies (dilute vinegar, soap, water, basins, lotion) and example of how to do it. 8) Once done, dispose of water in evaporator, clean basin for next use. We also provide fresh cold water to drink and light snacks like cold grapes. We provide a 60’x40′ public shaded area that provides relief from the hot sun. Our foot wash stations are located under the shade structure, but there are no walls, so it is a very nice open, airy relaxing environment. We gladly welcome everyone to our camp, both to receive foot wash service as well as to give. We are totally looking forward to this year and having a “home” within the Burning Man community for this much appreciated service. Familiarizing newer Burning Man event participants to our culture and community is a vital role of Placed Camps. How does your camp encourage Participation, teach about the 10 Principles and set expectations about what it means to be a Burner? Please describe how your Camp acculturates its members and the greater community. Our camp holds regular (every 2-3 weeks) conference calls going over Burning Man principles and how we plan to express them. We also have a group that has been focusing on the spiritual as well as practical applications of the 10 Principles, and thinking of inspiring ways of embodying those Principles. We love all 10 of the Principles. The Principles we strive to embody / express most in our camp are Radical Inclusion, Gifting (the main reason many of our participants are coming with us), Communal Effort, Civic Responsibility, Participation and Immediacy. We scored 100% clean on the MOOP map last year (aka we Left No Trace). Our camp is very low impact, and we emphasize with all new participants the need to really embrace the principles of Burning Man, including subscribing to Jack Rabbit Speaks, reviewing thoroughly the Burning Man website, and learning from our past experiences at Burning Man. We need a description of the layout of your Camp. Please describe the physical aspects with as much detail as possible. Include a description of features like structures, buildings, vehicles, tents, platforms, and the locations of your power sources. Maximum of 400 words. Our camp consists of a central welcoming area defined by a 40’x60′ open public shade structure. This structure is composed of a central 6’x6′ column with 14′ bracing for reflective shade cloth that extends out in a cross shape. We have a 30′ dome (from Shelter Systems) that we provide as a public quiet space for reading (as well as camp participant sleeping area). We have additional tents for sleeping, a kitchen area, a water evaporator. We use solar panels for our light power needs. Our lighting is all solar powered LED. We park cars and RVs in the back of our camp, as our purpose is expressly to be warm and welcoming to public interaction. We have a private shower that is for use of our campers. We have bike parking in the front of the camp. Please limit your description to two sentences. Remember, this is our voice to the world. Please consider this when submitting. Please give us the correct URL; any future changes to the web address will be difficult. All submissions will be reviewed and may be edited. After your submission it will take about two weeks for the description to appear on the site. Please include the description of your Camp that you would like to have included on the Burning Man website. Come have your feet washed in a quiet, safe and loving environment. You may come back and wash other people’s feet after you’ve had yours washed, all are welcome! Regardless of the decision of the Placement team at Burning Man, we’re confident we will be in our right place at 2014 Burning Man and will have the opportunity to be of service to hundreds of people during the week-long festival! I’ve begun doing some preliminary reading about washing feet, per last night’s teleconference. I see a Wednesday night topic in the making! “Cleanse every stain from this wanderer’s soiled garments, wipe the dust from his feet and the tears from his eyes, that you may behold the real man, the fellow-saint of a holy household,” ‘Retrospection and Introspection,’ by Mary Baker Eddy (Pg. 86). The playa is our ‘holy household’ for the week, filled with fellow-saints! And again, when you read the passage in context, it is clear that this cleansing starts with one’s self.